Corporate Social Responsibility (CSR) is one of the promotion techniques done by a Public Relations in higher education institutions to face the tougher competition among the higher education institution in gaining new students. Most higher education institutions in Salatiga try to do some CSR programs to achieve their goal. This study tries to investigate what suitable model of CSR done by higher education institutions in Salatiga-Central Java which is also implemented and the influence of this program to students’ intake in one academic year. Lastly, it tries to propose a CSR modeling for increasing students’ intake at higher education Institution in Salatiga-Central Java. This study employs interview and literature study for data collection. The data are then analyzed qualitatively to answer the posed research questions. This study involved 7 Higher education institutions in Salatiga-Central Java and also 19 High schools which are spread in 7 cities in Central Java. The result of the study shows that the Public Relations unit in each higher education institutions has carried out their CSR program to some of the Schools in Central Java, but lack of coordination done by both parties. However they emphasize their CSR program focusing on community service, high school student activities, scholarships and training. In order to effectively achieve the goal, an intake cycled relations model is proposed. Carrington, P., J. Scott, dan Wasserman. 2005. Models and Methods in Social Network Analysis Cambridge. Cambridge University Press. Dahan, G. S., dan I. Senol. 2012. Corporate social responsibility in higher education institutions: Istanbul bilgi university case. American International Journal of Contemporary Research. Vol.2 No.3. Goodwin, F. W., dan J. L. Bartlett. 2008. Public relations and corporate social responsibility (CSR). Working Paper. Available at http://eprints.qut.edu. Hanneman, R. A., dan Riddle, M. 2005. Introduction to social network methods. Riverside, CA: University of California, Riverside. Available at http://faculty.ucr. Hornby, A. S.1995. Oxford Advanced Learner’s Dictionary, Oxford: Oxford University Press, Fifth Edition. Nejati, M., A. Shafaei, dan M. Daraei.2011. Corporate social responsibility and universities: A study of top 10 world universities. Academic Journals. Available at http://www.academicjournals.org. Moleong, J. L. 2006. Metodologi Penelitian Kualitatif: Edisi Revisi. Bandung: Remaja Rosdakarya. Nuryana, M. 2005. Corporate social responsibility dan kontribusi bagi pembangunan berkelanjutan. makalah yang disampakkan pada Diklat Pekerjaan Sosial Industri, Balai Besar Pendidikan dan Pelatihan Kesejahteraan Sosial (BBPPKS) Bandung, Lembaga 5 Desember. Porter, M. E., dan R. K. Mark. 2002. The competitive advantage of corporate Philantrophy dalam Harvard Business Review, Desember. Pramuningtyas, I. 2005. Tanggung jawab sosial perusahaan pada PT Batik Tjokrohadi Surakarta.Skripsi Program S1 Fakultas Ekonomi Universitas Kristen Satya Wacana. Scott, J. 2000.Social Network Analysis: A Handbook. London: Sage Publication Ltd.
Sinatra, L., dan Krismiyati. 2014. General rule of thumb of CSR program to increase intake in higher education. 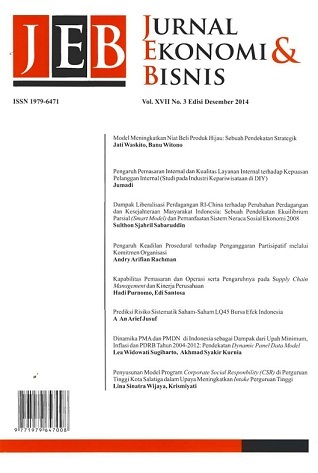 Jurnal of Arts, Science & Commerce-Researchers World. Vol.5 No.3. Saidi, Z., dan A. Hamid. 2004. Menjadi Bangsa Pemurah: Wacana dan Praktek kedermawaan Sosial di Indonesia. Jakarta: Piramedia. Suharti, L., dan A. Donafin. 2008.Corporate Social Responsibility (CSR): Teori dan Praktek. Fakultas Ekonomi: Universitas Kristen Satya Wacana Salatiga. Tanudjaya, B. B. 2006. Perkembangan corporate social responsibility di Indonesia. Jurnal Nirmala. Vol.8. No.2 (July): 92-98. Topal, R.2009. CSR in Universities Around the World. Social Responsibility Research Network. Wasserman, S., dan K. Faust. 1994. Social Network Analysis Methods and Application. New York: Cambridge University Press. Wineberg, D., dan H. R. Phillip. 2004. Corporate Social Responsibility – What every in House counsel should know dalam ACC Docket.